Results from research programs contribute to the biological foundation for and evaluation of bird conservation activities and are necessary to accomplish defensible biological planning. Below you’ll find research reports and articles that PLJV staff have authored. For more information about any of the publications or to request a copy, contact Anne Bartuszevige, PLJV Conservation Science Director. The U.S. Geological Survey, in cooperation with the PLJV, conducted a review and synthesis of more than 175 publications about recharge rates and chemistry beneath playas and interplaya settings. The results from most published studies indicate that recharge rates beneath playas are substantially (1 to 2 orders of magnitude) higher than recharge rates beneath interplaya settings. 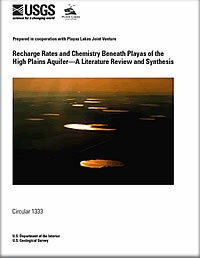 The synthesis supports the conceptual model that playas are important zones of recharge to the High Plains aquifer and are not strictly evaporative pans; it yields science-based implications for the protection and management of playas and ground-water resources of the High Plains aquifer and provides directions for future research. PLJV analyzed the effects of six hydrological, eight landcover, and six covariance structure variables on the inundation of playa basins, with the goal of determining the effect of planting grassland nearby in accordance with Conservation Research Program (CRP) guidelines. 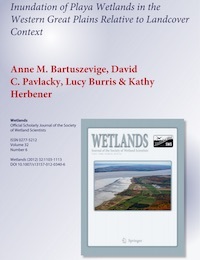 PLJV found that CRP grassland had a negative effect upon playa inundation, which was hypothesized to be due to CRP guidelines necessitating planting of non-native species. In contrast, CRP had a positive effect on the rate of culturally-accelerated sediment accumulation in playas. This study highlights the need for deeper analysis of CRP planting guidelines in order to inform program improvements that support playa conservation. 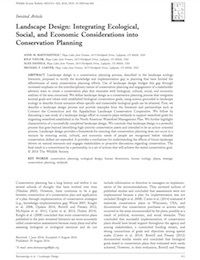 PLJV defined a comprehensive method of landscape design that combines conservation assessments and management plan implementation into a streamlined model of cooperation, evaluation, and application. Using a case study of PLJV’s efforts to promote dabbling duck populations in the Great Plains, the process of successfully effecting lasting change was analyzed and defined with a focus on involving stakeholders in the planning process and incorporating predicted human drivers. This method provides a useful system for implementing future landscape design and conservation efforts. 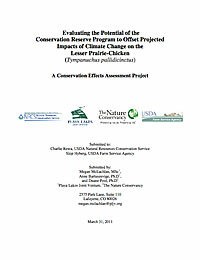 PLJV, in collaboration with The Nature Conservancy, completed a Natural Resources Conservation Service Conservation Effects Assessment Project to model projected changes in vegetation structure as the climate changes in the PLJV region and relate them to potential changes in Lesser Prairie-Chicken numbers. Climate change and dynamic vegetation models were used to project future climate and grassland habitat conditions within the region, including the current Lesser Prairie-Chicken range. These models provide insight as to where and what kinds of changes are most likely to occur and help resource managers target conservation efforts for maximum long-range benefits. 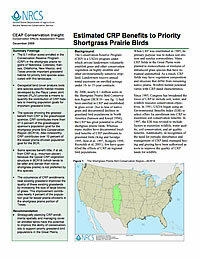 PLJV conducted a study to quantify the effects of the Conservation Reserve Program (CRP) on priority birds in the shortgrass (Bird Conservation Region 18) prairie. This study quantifies the impacts of CRP on regional bird populations and explicitly answer the question, “How many birds does CRP support?” The study was funded by the Natural Resources Conservation Service through the Conservation Effects Assessment Project program. 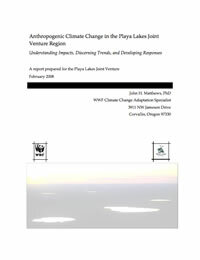 An assessment of climate change impacts in the playa lakes region was conducted by Dr. John Matthews, Climate Change Adaptation Specialist for the World Wildlife Fund. The assessment serves to inform PLJV partners of the realized and potential impacts of climate change to bird habitats and populations in the region and to recommend appropriate habitat conservation actions to compensate for these impacts. It also provides an overview of ongoing and predicted climate and weather changes and trends, and how these changes are impacting birds and bird habitats now and into the future. 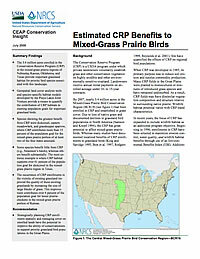 PLJV conducted two studies to quantify the effects of the Conservation Reserve Program (CRP) on priority birds in the mixed-grass (Bird Conservation Region BCR 19) prairie. This study quantifies the impacts of CRP on regional bird populations and explicitly answer the question, “How many birds does CRP support?” The study was funded by the Natural Resources Conservation Service through the Conservation Effects Assessment Project program.